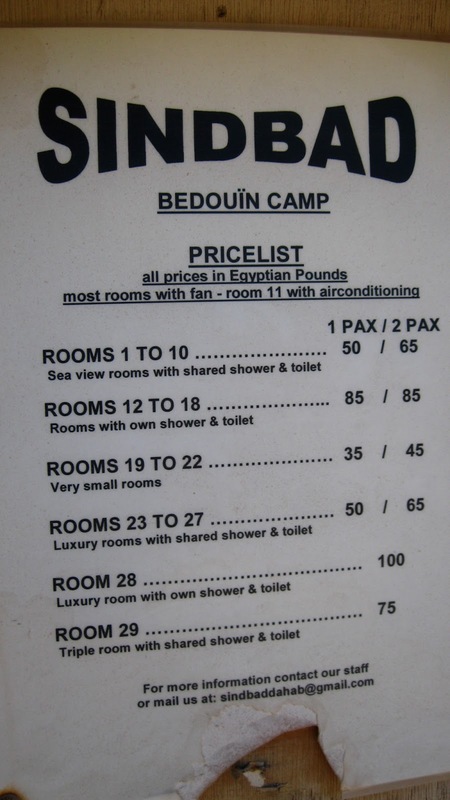 Sindbad Camp is one of the most well regarded budget accommodations in Dahab, Egypt. It is easy to see why. First, it is very hard to beat Sindbad's location, which is right along the corniche of Dahab and a short walk to the central tourist area of Dahab. Sindbad's prices are hard to beat as well. The prices listed on the sign out front were discounted while we were there due to there not being many tourists in Egypt. There are a few different types of rooms at Sindbad. There are a couple of rooms with bathrooms inside. These are located across from the restaurant and are facing the water. These rooms are more expensive than the other rooms, which share facilities. There are quite a few rooms that face the sea, and some smaller rooms that do not face the sea. The rooms themselves either have two twin beds or a double bed. Most of the rooms have mosquito nets, a table, lamp (ours did not have a bulb). Some rooms have some additional shelves. You may want to take a look at a few of the rooms when you check in. Some have a window and others have light that comes in through openings in the walls above. Each room is painted differently and has its unique character. Keep in mind that this is an old beach camp and is not supposed to be fancy. If you come with that in mind, you may just find Sindbad Camp charming. Sindbad camp is very laid back. We were not bothered with offers for tours while staying. There is a room with cushions and pillows for relaxing in. There are also a pair of hammocks out in front of the sea view rooms. Sindbad has bikes for rent as well for those who want to ride around and see what Dahab truly has to offer. There is a small library area with books (mostly in German) as well as games (Chess and Dominoes). There is also a minibar area with Coke and water for sale for 5 LE each. A block away, however, you can get soda for 3 LE and water for less. In front of the sea view rooms. The common area at Sindbad camp. There is a small restaurant at Sindbad with prices that are cheaper than the prices at the waterfront restaurants in Dahab along the beach. However, there are still better values to be found, especially if you wander off the main strip and visit the small Egyptian style restaurants that are around the city. Portion sizes at Sindbad Camp are large and the food is comparable in quality to what you find along the waterfront. The only negatives are that Sindbad Camp is starting to show its age, but this hardly matters if you are looking for a cheap place to stay. The rooms are no frills rooms. There is neither a TV, air conditioner, nor is there room service. However, there is wireless internet and hot water in the showers. With that said, the showers can be iffy at times. In the week and a half we spent at Sindbad, there were some pipe problems that caused minor flooding in the showers. This was taken care of rather quickly. In fact, we noticed that the cleaning service constantly is mopping and cleaning the restrooms and common areas and Sindbad is, overall, clean as a result. 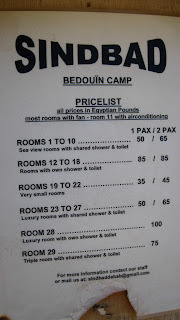 Overall, Sindbad camp is a good deal and worth checking out if you are in Dahab. As said on the website: "it is not the most luxurious place," nor does it try to be. The prices are some of the lowest you will find in the area, and you will find that those who run the camp are friendly, honest, and helpful. 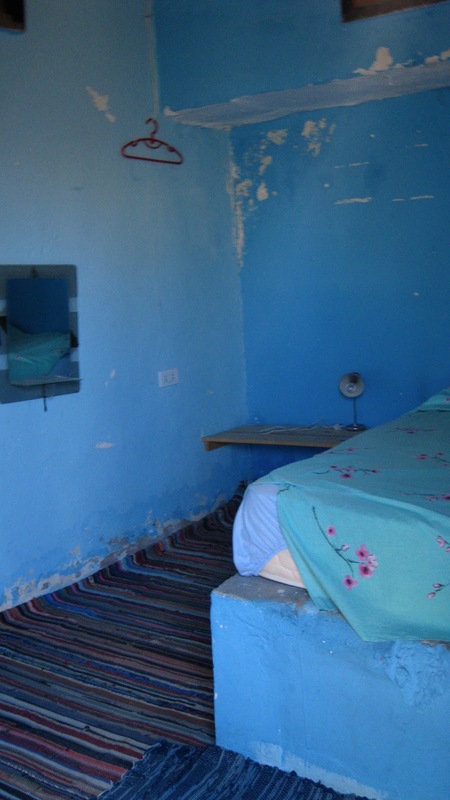 If you want a place to stay that is located right on the waterfront, is cheap, and is right in the middle of the action of Dahab, then you have come to the right place. How to get to Sindbad Camp: If you are arriving by bus, take a taxi from the bus station (this should cost you 5 to 10 LE. You may have to haggle somewhat) to either the camp (if the driver knows where it is), or to the lighthouse, which is next to Sindbad Camp. There are signs from here that will point you the way.